The objective of this paper is to develop a prediction tool for burden distribution of a blast furnace (BF) by using Discrete Element Method (DEM). The high-speed video recording in an actual blast furnace process was tried to capture the particle behavior in Nagoya No.3 BF, and the particle trajectory discharged from a rotating chute was also measured by using a pressure sensitive sheet. The modeling of particle behavior was conducted by DEM, and the simulated behavior was compared with the measured results. 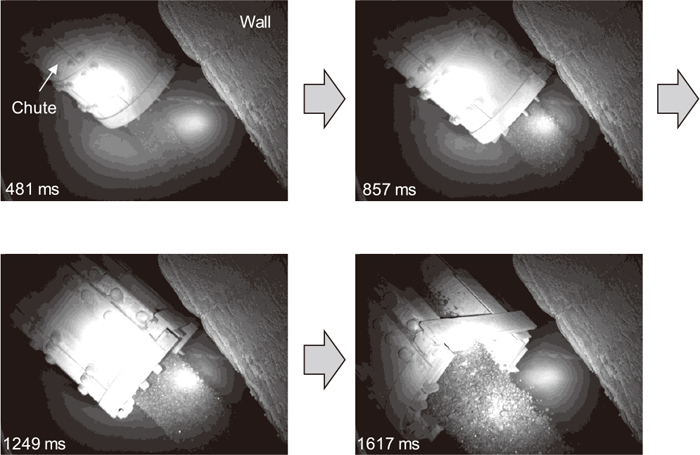 The particle discharging behavior was recorded from a large manhole during a shutdown, and an individual particle was able to be seen in the images. It was observed that the particles were pressed up against the chute side wall due to the centrifugal force of chute rotation. The particle discharging velocity was analyzed by Particle Image Velocimetry (PIV). It is found that the velocity of coke particle is larger than that of sinter because of the particle size. This difference affects the particle discharging trajectory, and the one for coke particle is shifted toward the BF wall by comparing to that for sinter. The simulated particle behavior using DEM has a good agreement with the observations, both by the high-speed recording and the trajectory measurement. Therefore, it can be concluded that this particle simulation has high reliability for prediction of the particle trajectory in the actual blast furnace operation.